In order to travel, race or compete horses must meet certain vaccination requirements. When transporting a horse these requirements vary depending on the country of origin and the country of destination. 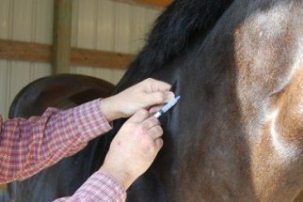 There is particular variation in equine influenza vaccination protocols for sport and travel. Below are some examples. Remember to always obtain specific and up-to-date advice from your veterinarian and Official Body of Sport before embarking on a vaccination regime as the protocols may change. For more information on Equine Influenza Control please click here. Primary Course: Interval of 21-42 days. Both doses SAME vaccine type. First Booster: within 12 months of a certified primary course & subsequent Annual Boosters required. Warning: The final dose must not be older than 60 days (for permanent export) and 90 days (for temporary export). The primary vaccination and booster shots must all be documented in the passport. Please note: These pages are intended as guidance only and their accuracy cannot be guaranteed.